To help schools be strategic in addressing the “physical education and physical activity” core component of the Whole School, Whole Community, Whole Child (WSCC) model, a Comprehensive School Physical Activity Program (CSPAP) provides a framework to plan and organize activities for school-based physical education and physical activity. The goal of CSPAP is to increase physical activity opportunities before, during, and after school and increase students’ overall physical activity and health. Healthy and physically active students tend to have better grades, school attendance, cognitive performance (e.g., memory), and classroom behaviors (e.g., on-task behavior). To learn more about the individual components of the CSPAP framework and national guidance regarding each component, click on the links below and start exploring. 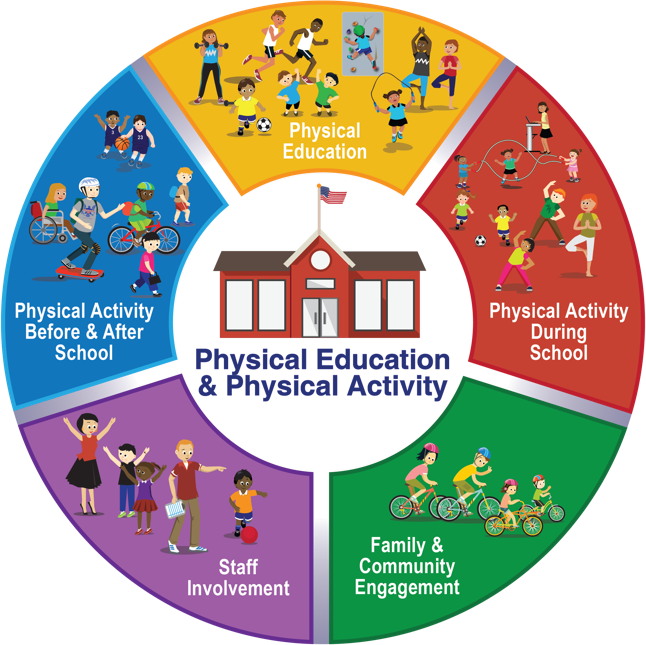 Physical education is a K-12 academic subject that provides standards-based curricula and instruction that is part of a well-rounded education. Physical education is designed to develop the knowledge and behviors for physical activity, physical fitness, and motor skills in students. It serves as the foundation for equipping students to be physically active in other areas of the school and beyond. Click here for resources and tools focused on physical education. Physical activity during school includes classroom physical activity and recess. Classroom physical activity includes any physical activity done in the classroom (E.g., stretching, jumping, dancing) during the school day. Recess is a regularly scheduled period within the school day for physical activity and play that is monitored by trained staff and volunteers. Click here for resources and tools focused on physical activity during school. Physical activity before and after school provides opportunities for students to be physically active and practice what they have learned in physical education class. Activities might include walking or biking to and from school, physical activity clubs, intramural programs (sports organized by the school or community in which any child can participate), interscholastic sports (competitive sports between schools), and physical activity in before-school and after-school extended day programs. Click here for resources and tools focused on physical activity before and after school. Staff involvement means that school staff members serve as positive role models for wellness and integrate physical activity into classroom instruction and breaks. It also means that staff members support recess, clubs, intramural programs, and other physical activity offerings. Schools can also provide employee wellness programs to encourage physical activity among school staff. Click here for resources and tools focused on staff involvement. Family and community engagement in physical activity means that parents, school staff, and community members work together to increase physical activity opportunities before, during, and after the school day. Family and community members can also work with schools to promote opportunities for physical activities inside and outside of the school building. Community organizations can establish shared use agreements with schools that allow them to use school facilities for physical activity opportunities or events. Click here for resources and tools focused on family and community engagement. To read more about the CSPAP Framework, download CDC’s report: Increasing Physical Education and Physical Activity: A Framework for Schools.